Beyond the handful of national retailers selling its line of phones, MetroPCS has been doing well on its own, establishing itself as one of the powerhouse prepaid carriers in the nation. However, they’re planning to ramp things up seeing that they’re making a push in the online space. Showing their commitment to expand beyond its retail shops and store partners, MetroPCS announced that it has made a partnership with online retail giant Amazon. 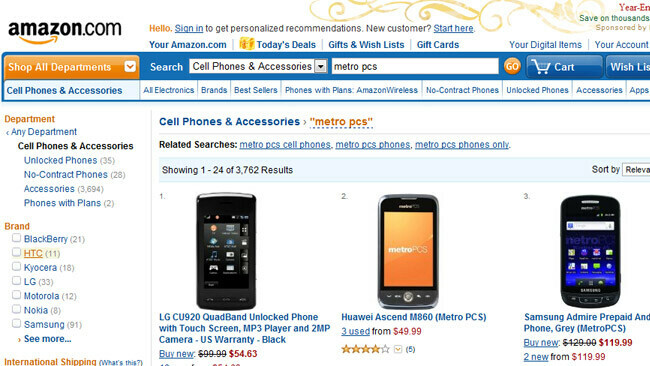 Specifically, a portion of MetroPCS handsets are now available for purchase through Amazon’s web site, which range from feature phones and smartphones. Not only will customers be seeing some great deals on some of the devices, but it’s yet another way they can purchase devices aside from the usual routes. Well, after making a purchase from Amazon, customers have a number of ways to activate their new device – like visiting a MetroPCS retail location, logging onto the MetroPCS web site, or by dialing *228 from their new phone. I Think you mean President and CEO not COO. That sounds funny. How's the reception in major cities (LA/SF/SD) of California compared to AT&T and T-Mobile? Their pricing on plans is really tempting! In SF south bay area, it's actually not that bad. Not sure about data speeds, only had a dumbphone Nokia with metro for a short while. A friend knew of dead zones, I never encountered any. I didn't use it that much though. There are no contracts so you can try it out. You just have to pay full price for phones, try with the cheapest dumbphone first. thanks for the information. I will think about it. I think it's better to have the choice of contract with discount phones though.